Abhijit Bharali writes a detailed tactical analysis about the exciting 1-1 Premier League draw between Everton and Spurs. Everton and Tottenham Hotspur played out a fascinating 1-1 draw at Goodison Park, a result which helped neither team’s cause. 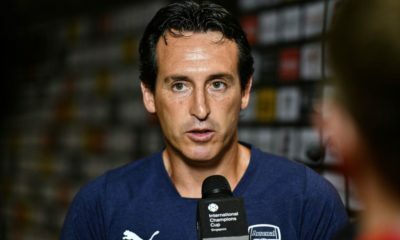 Everton were left stranded on 11th, while Spurs failed to maintain a positive push for the title as rivals Manchester City and Arsenal won their respective games. Everton: 24. Howard; 23. Coleman, 5. Stones, 25. Funes Mori, 3. Baines; 15. Cleverley, 18. Barry, 12. Lennon (Deulofeu, 60′), 20. Barkley, 9. Kone (Besic, 60′); 10. Lukaku. Tottenham: 1. Lloris; 2. Walker, 4. Alderweireld, 5. Vertonghen, 33. 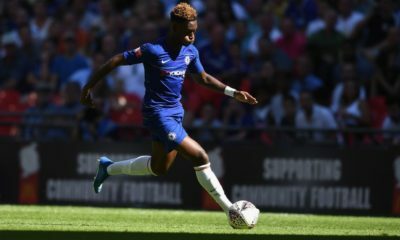 Davies; 15. Dier, 28. Carroll, 23. Lamela (Onomah, 88′), 20. Alli (Chadli, 83′), 11. Eriksen (Son, 69′); 10. Kane. Left-back Leighton Baines came in for Brendon Galloway while club captain Phil Jagielka was fit enough only for a start from the bench. Aaron Lennon started ahead of the rested Gerard Deulofeu, as Roberto Martinez had one eye on midweek’s League Cup semi-final against Manchester City. Everton started in a 1-4-3-3, with Gareth Barry being the deepest midfielder, and Tom Cleverley supporting him along the left channel. Ross Barkley shuttled from his starting position on the right half-space, while Lennon hugged the right touchline and Kone drifted across the pitch in support of lone striker and joint league top scorer Romelu Lukaku. Ramiro Funes Mori and John Stones were the two Toffees centre-backs; right-back Saemus Coleman and goalkeeper Tim Howard completed the back five. Spurs, meanwhile, remained true to their now-template 1-4-2-3-1, but had better dynamism in different phases. Like Everton, they too played with a lone striker in Harry Kane, but their positional interchanges were more profound in the attacking third, unlike the hosts. While Dele Alli was deployed to play in and around the “10 space”, all three of Alli, Christian Eriksen and Erik Lamela drifted into the centre. Eriksen was virtually playing along the right half-space, with right-back Kyle Walker playing along his sides on the right wing. Lamela, with lesser support on the sides from left-back Ben Davies, stuck to a wider shift. Mauricio Pochettino had a new partner for Eric Dier in the midfield base in the form of Tom Carroll, while the central defensive axis of goalkeeper Hugo Lloris and the Belgian centre-back pairing of Jan Vertonghen and Toby Alderweireld remained unchanged. Spurs started the brighter of the two teams, and their well-documented high pressing style was in evidence right from kick off. Alli, Kane, Lamela and Eriksen created a high pressing block around the Everton defence. This forced the Toffees to hit directionless long balls under pressure which were easily dealt with and recycled by the away side. Everton were lopsided in wide areas, with Lennon playing more as a traditional winger on the right while Kone, who isn’t a natural winger, drifted across the breadth of the pitch and also tried to play close to the increasingly isolated Lukaku. At times, the Ivorian was seen on the right, leaving a void in his starting position on the left. Spurs reacted well to Everton’s lopsidedness on the sides, as Walker was pushed up to play almost as a right winger in the opening exchanges, with Dier slotting in as the right-sided centre-back in a shape which looked like a back three at times. This tactic was, in part, to allow more time on the ball for Alderweireld, who has a knack of pinging long diagonal balls like a deep-lying playmaker. Both Dier and Carroll played closer to the two Spurs centre-backs, which allowed greater freedom for the full-backs to motor forward. This was mainly due to Everton’s discipline in central areas, which did not allow any kind of central penetration for Spurs. But Spurs’ greater dynamism meant they reacted well to the in-game conditions, and took advantage of Baines’ isolation on the left, with Kone’s positional indiscipline leaving the England international exposed. Walker posed a threat as Eriksen picked perfect passes out to the wings, but Spurs could not capitalise on a particular Everton weak zone. As the half progressed, Kone became better disciplined and tracked back diligently although that completely took Everton out of the game as an attacking unit. It was almost a low five-man block in front of the back four for the Toffees, with Lukaku ploughing a lone furrow against his compatriots up front. The fact Everton sat so deep was in part effected by Spurs’ high press, as the Toffees always tried to offset the greater attacking threat of their opponents by outnumbering them near the goal. This early bus parking by the home side had its consequences too. Everton never tried to play through Spurs’ press, understandable given their defence has been a shambles in recent weeks. Instead they tried to bypass the press by going long, which in turn played into Spurs’ hands. Everton’s lack of numbers up field meant their’s was a weak forward press, which allowed Alderweireld to dictate proceedings as the spare man from the back. Alderweireld played the most number (12) of long balls in the game, and completed 66.67 percent of them (8), the most in the game in amount and only behind Cleverley in success percent, who completed 71.4 percent of his seven long passes attempted. 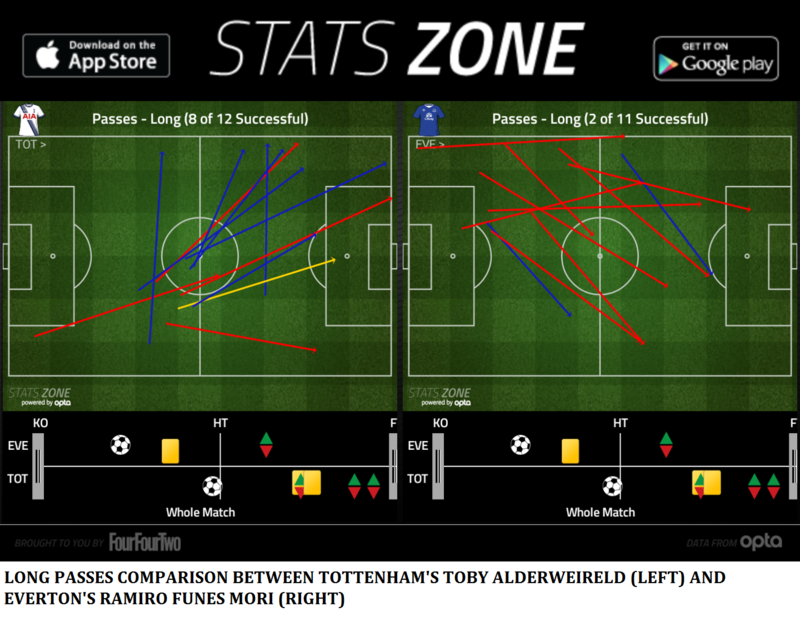 To put some context, Funes Mori attempted a similar number (11) of long passes, but only two of them were successful, which clearly shows how Spurs’ pressing meant the Everton defender was always under pressure, while Alderweireld had more than enough time on the ball to pick a team-mate. Even Alli’s goal came from a diagonal ping from the Belgian. It wasn’t the same script throughout though. Everton enjoyed attacking phases of their own, but Spurs were almost always in shape during defensive transitions which reduced the Toffees’ attacks into nothing more than a procession of cheap possession turnovers in their attacking third. 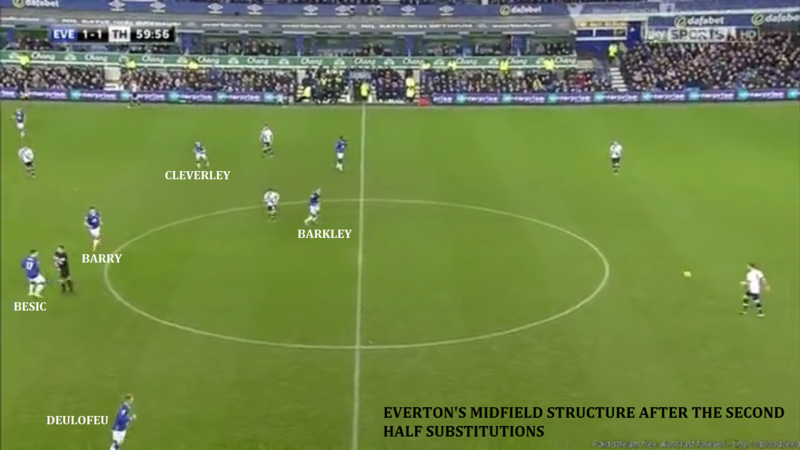 As the first half progressed, Everton pushed slightly higher with Barkley playing more in a box-to-box capacity but Spurs were always dangerous in attack. One such Everton move deep into the Spurs half led to a quick transition which saw gaps in the Toffees midfield open up, but Alli and Lamela failed to combine well. Everton’s goal stemmed from their first successful pressing action and ball recovery in the Tottenham half, a fact clearly demonstrating the passivity of the home side as compared to the away side. Up until that moment, Everton were happy to sit off and soak pressure instead of being more proactive, which directly led to the goal. The fact Spurs have no great offensive 1v1 players was one of the reasons why the Lilywhites, despite having the run of play for most part of the game, failed to score more goals. Lamela, Alli and Kane all found themselves in isolated 1v1 situations during the game, but failed to make most of those situations owing to their qualitative deficiencies. 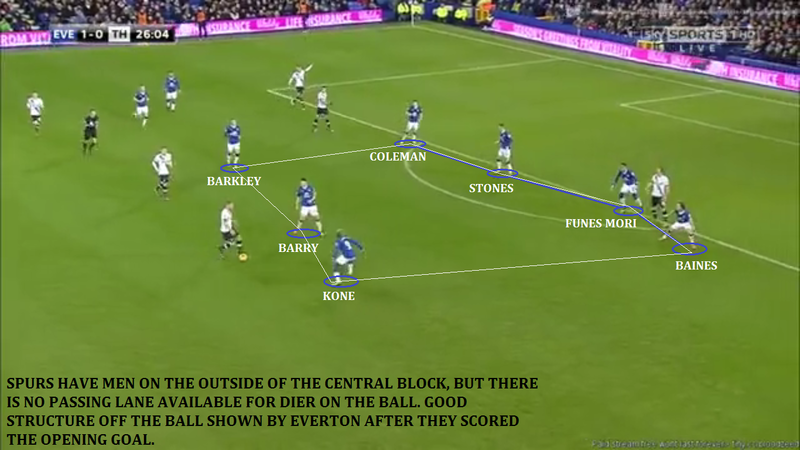 And the fact Everton maintained their defensive shape owed much to the lack of the unpredictable from Spurs. Interchanges and combinations were read well, and final passes were often too easy to deal with or into impossible areas. Spurs were, in a way, predictable and had most of their attempts from outside the box (15 out of 19). Second half saw a welcome change of approach from Everton, as unlike in the first half, they pressed Spurs’ build-up play. Lukaku, Kone and Barkley prevented ball circulation between the Tottenham centre-backs and Lloris. 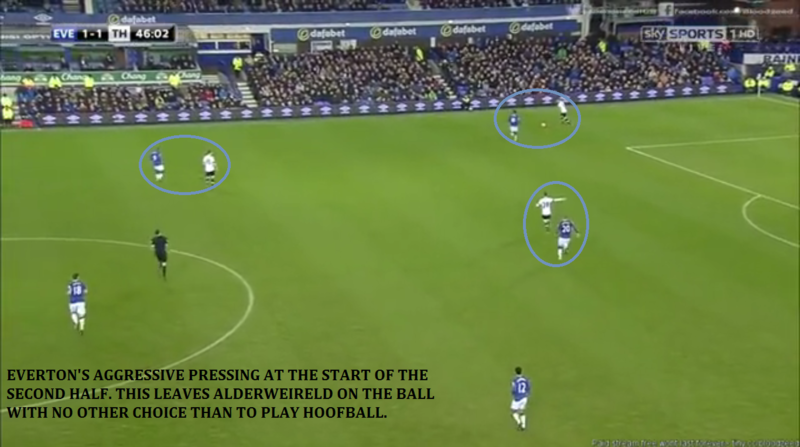 The suspect first half approach from the Toffees which allowed time and space to Alderweireld was addressed. Another feature of the second half was Spurs’ tailing intensity. 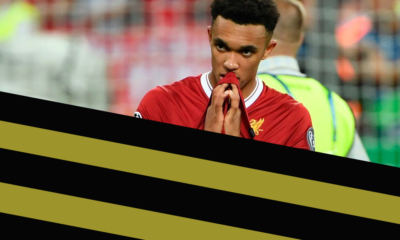 Their high pressing scheme became patchier, and at times, the players resorted to sitting in a midfield block during defensive phases, seemingly in a bid to preserve energy and hit Everton in possession breaks. Spurs were increasingly resorting to counter attacking, and the game was invigorated by the substitutions. Spurs were also structurally weaker in the second half as the following passage shows. Alderweireld emerges with the ball with Everton in transition, but the direction of his diagonal pass is towards Lamela (not in frame) who is much deeper on the left. Kane is in a much better position for a run behind Everton’s defence than Lamela, who ended up being too slow and exposed by Coleman in a 1v1, and also elbowed the Everton right-back in the process. Everton made the first moves, and the introductions of Muhamed Besic and Deulofeu for the final half hour added a newer dimension to the Toffees’ structure. Deulofeu stayed extremely wide on the right, while Besic slotted on the right of Barry as Cleverley took Kone’s place on the left. 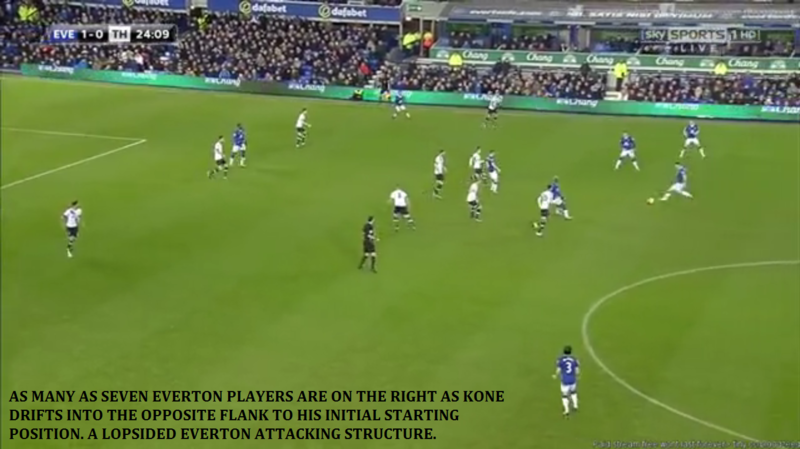 Cleverley offered a much more secure presence on that side than Kone, and more compactness. The second half changes stretched Spurs as Lukaku occupied Vertonghen and Alderweireld, and Deulofeu being proficient in 1v1 situations and a sublime crosser of the ball meant Spurs were almost lucky to not concede in the second half. Besic added bite in midfield with his crisp tackling and simple passing, and should have scored Everton’s second had it not been for Lloris’ fine save. For Tottenham, Son Heung-Min and Nacer Chadli replaced Eriksen and Alli respectively, but by then, both teams lost their structure and Everton were edging the game with Barkley bossing it towards the end. His switches of play stretched Spurs and found Deulofeu in plenty of space down the right on two occasions, but the Spaniard couldn’t cap off his fine cameo with a game-changing moment. 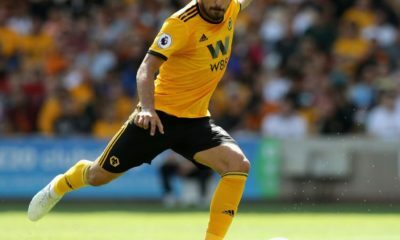 With fading energy levels, the game became more end to end as the final whistle drew nearer, with both teams seemingly running on empty tanks towards the end of a game in what has been a physically demanding schedule of fixtures. Spurs started on the front foot, but were eventually pegged back by Lennon’s goal against the run of play. Everton grew into the game as it progressed, and were the better team at the finish, aided by some smart tweaks by Martinez. The draw was a fair result on the balance of play, but both sets of fans would be disappointed to see their respective teams not closing the game with some very presentable chances.